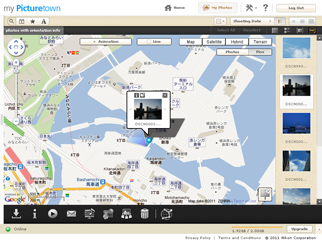 TOKYO-Nikon Corporation is pleased to announce the release of the latest version of my Picturetown (http://mypicturetown.com ), Nikon's image sharing and storage service, with new and better functions and features. The latest upgrade of my Picturetown enables simpler playback of movie files as well as support for the playback of Motion Snapshot files recorded with Nikon 1 advanced interchangeable lens cameras. 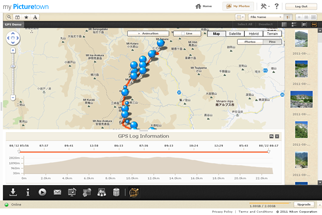 In addition, GPS support (map view) has been expanded and improved to display log data recorded using the GPS function built into Nikon's new COOLPIX AW100 on a map, allowing users to view and share a record of their movement over a specific period of time. *In Motion Snapshot mode, simply pressing the shutter-release button records a still image and about a second of movie footage beginning before and ending after the time the shutter-release button was pressed. Movies recorded in Motion Snapshot mode are played back in slow motion. With slow-motion playback at 0.4x normal playback speed of the movie and a still image, Motion Snapshot allows users to express impressive moments that show slight changes in expression, the rustling of tree leaves, or fluctuations in nature. With the current version, movies are played back in a separate window. With the new version, however, operation has been improved so that by simply clicking on a movie thumbnail, movies begin playing in the current window, regardless of the selected view. * As movies can be played back at the preferred thumbnail size, the new movie function is also convenient because it enables consecutive playback of multiple movie files. In addition, as full-screen display in the browser window is also possible, users can enjoy their movies easier and more quickly. *Depending upon the movie file format, some movies may still be played back in a separate window. Motion Snapshot files recorded with Nikon 1 cameras can be uploaded to, played and shared on my Picturetown. 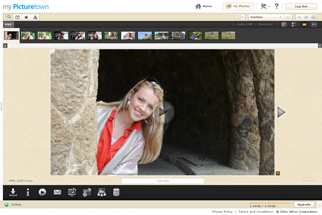 This allows you to share Motion Snapshot, a new form of imaging expression proposed by Nikon, with family and friends. The GPS function built into models such as the Nikon COOLPIX AW100 periodically records position information as GPS log data. This log data can now be displayed in map view to show your route of movement over a specified period of time. Additional features, such as a graph display of GPS log altitude and display of heading information and location names (points of interest or POI) recorded in photo information allow users to view a detailed record of shooting scenes along with the photos themselves. When GPS log data recorded in NMEA or GPX format is uploaded to my Picturetown, a route of movement can be displayed in the map view window. 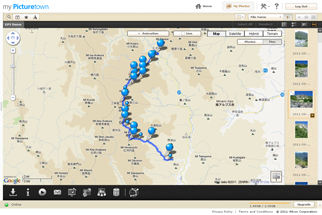 As the GPS log displayed for each album can be selected, users can manage the route of movement along with photos. In addition, by sharing an album, photos and the route of movement can be shared with family and friends. Altitude* with movement can be displayed on a graph. *Altitude displayed by the AW100 is approximate. Heading information recorded in image data with shooting can be displayed in the map view window. When location names (POI) are added to image data recorded by the COOLPIX AW100 with shooting, these location names are displayed as photo information. In August of this year, Nikon celebrated the fourth anniversary of the my Picturetown service. Since its launch, my Picturetown membership has grown to 1,500,000. With the development of new functions and services, and improvements to those with which members have become familiar, Nikon and my Picturetown continue to propose new ways of enjoying digital photos.